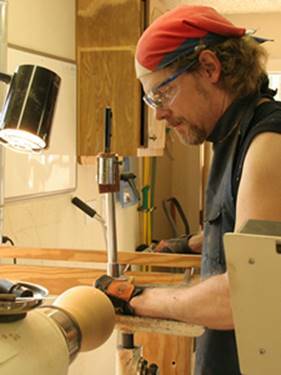 Craig Timmerman is a full-time artist and production woodturner living in Austin, TX. 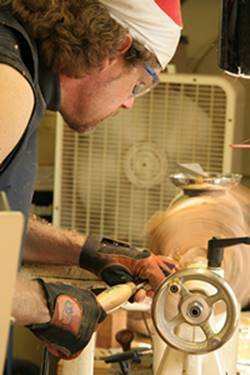 He is a nationally-known woodturner and gives demonstrations and woodturning instruction. 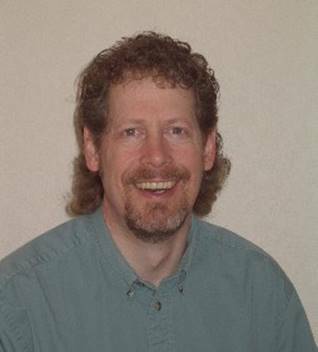 His program on “Multi Axis Turning” will give you an opportunity to explore the idea of making your turnings with an artistic flair. He picked u p woodturning in 1998 when he took a weekend class at a local store. After that weekend the wood working equipment in his shop ceased to be used for anything except woodturning. He has now expanded into using bent lamination (the process of gluing of thin strips of wood and bending them under pressure over a form) to augment his turnings and to produce new and exciting pieces. Craig's specialties include hollow forms, spheres, and non-round (e.g. square) turnings. Many of his pieces combine multiple turnings and bent laminations. He works primarily with reclaimed timber--trees that have come down in storms, trees being taken down for construction, and the occasional piece of firewood. Reclaimed timber is often filled with flaws of different kinds, such as cracks, bug holes, or voids. Rather than try to remove the flaws, he accentuates them by making them the focal point of the piece, filling them with crushed stone, or carving them into other shapes.